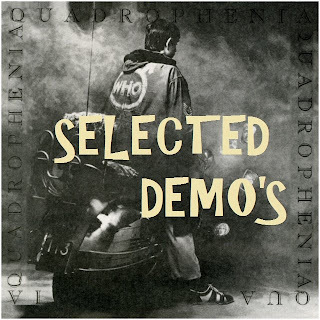 The Who - Selected Quadrophenia Demo's. This is a selection of demo's that in part eventually led to The Who recording one of their most popular and enduring albums namely Quadrophenia. Quadrophenia was recorded at Ramport, The Who’s own studio in Battersea, south London in May and June of 1973, and these demo's are predominately the very early stages of the process including Pete Townsend performing his work to the rest of the band. The album, The Who's second 'rock opera' was released to coincide with The Who’s first UK and US tours for two years, it reached number 2 in both countries’ album charts. It was immaculately packaged in a handsome black and white gatefold sleeve, complete with extensive liner notes outlining the story and a 22-page book of evocative black and white photographs illustrating the central character Jimmy’s personal odyssey.